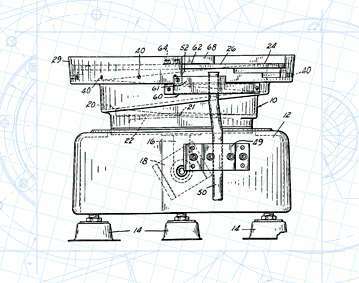 The present invention relates to vibratory feeders of the bowl type and is concerned, more particularly, with an improvement in such feeders rendering them capable of orienting parts which heretofore have been impossible or extremely difficult to feed automatically. Vibratory feeders of the type to which the present invention relates are intended to receive a batch of un-oriented parts and feed them individually and in sequence in a uniformly oriented manner. To accomplish this purpose, the bowl is rapidly oscillated about its axis and at the same time is reciprocated vertically so that the parts placed in the bowl will travel upwardly in sequence on a helical ramp disposed on the interior of the bowl.